We know you are one of the most creative young people on Earth. So lets make it fun. Think about and be ready to present the next mini game for My Talking Tom or My Talking Angela that will be played by millions and explain why your game should be implemented. 5. Having fun while playing it. P.s. : All submitted ideas will be treated under these conditions. Best known for its global phenomenon Talking Tom and Friends, Outfit7 Limited is one of the fastest-growing family entertainment companies on the planet. Here at Outfit7 Limited, we love to play. Here there are no rules, no boundaries, no locked doors or you’re-not-alloweds. Ours is a world of yes, not no, and here you are free to play. Best known for the global phenomenon Talking Tom and Friends, we are one of the fastest-growing family entertainment companies on the planet. Our company was formed in 2009 by a group of creative visionaries with a mission to entertain and empower the inner child in us all. Our first creation, Talking Tom, was an instant sensation and the fun just keeps on going! We now have over 2.5 billion global downloads and an ever-increasing monthly active user base of a quarter of a billion across our iconic suite of apps. With a movie in production and an upcoming CGI animated series, a global licensing and merchandising program, a thriving social media presence and several incredibly popular YouTube channels, we’re going from strength to strength. Our dedication to creativity and innovation has catapulted us to the forefront of the digital entertainment era and we couldn’t be prouder. So come join in and play on. There are now six lovable characters (Talking Tom, Talking Angela, Talking Ginger, Talking Ben, Talking Pierre, and Talking Hank) and 15 apps within the Talking Tom and Friends umbrella brand. The characters are also the stars of an upcoming 3D CGI animated series called Talking Tom and Friends”, which will be launched on our YouTube channel on April 30, 2015. The series will also be a flagship product on Google’s brand new YouTube Kids app. Talking Tom and Friends will soon be making their silver screen debut as well. 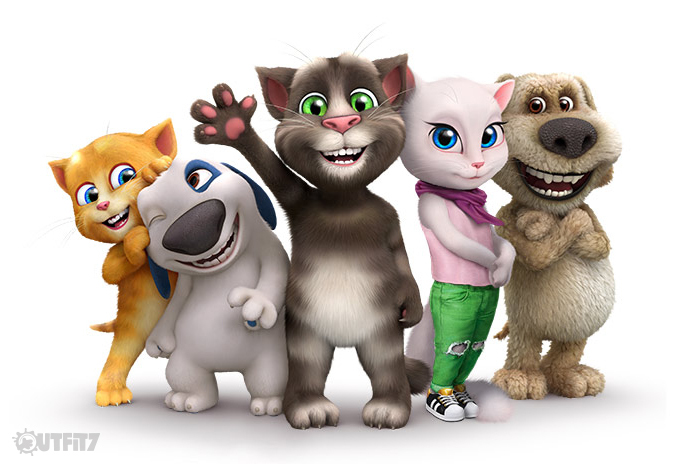 We have partnered with Mythology Entertainment in a deal to adapt the Talking Tom and Friends universe into a fully animated or hybrid live-action/animated motion picture franchise for family audiences. Bee7 is a user acquisition and monetization platform for Android, created especially for games. Bee7 makes it easier for developers to acquire loyal users, boost retention, and monetize their games. Created by multinational entertainment company and game developer Outfit7 Limited to help other developers overcome the challenges of making profitable games, Bee7 uses the same technology that propelled Outfit7 from a start-up to achieve in excess of 2.5 billion downloads. Founded in 2014, the Bee7 platform, owned by Bee7000 Limited, is growing rapidly, already reaching 200 million monthly active users. While Bee7 Limited, responsible for all sales, is headquartered in London, it has expanded its presence to San Francisco and Singapore. Find out more by visiting www.bee7.com.